In An Email, Hillary Clinton Once Wrote: 'Plumpy'Nut?' Plumpy What? : Goats and Soda The latest batch of Clinton emails includes a scattershot list of topics from a day in 2010: "Freud's Last Session," "Create co to own copyrights?" ... "Plumpy'nut?" 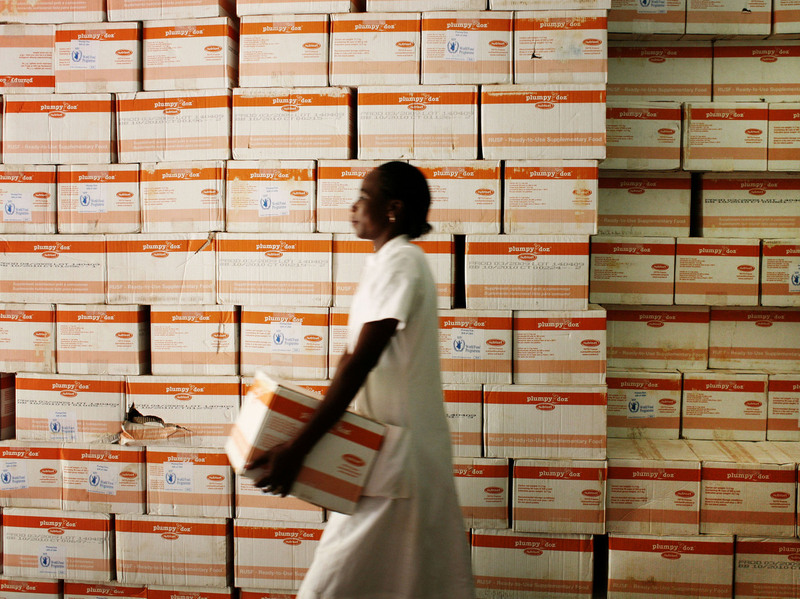 A nutritionist fetches a carton of Plumpy'Nut for malnourished patients at a hospital in Burkina Faso. In the latest batch of Hillary Clinton emails to be released, there was a list of topics that she presumably wanted to look into some more, dated Oct. 18, 2010. One line in particular stood out: "Plumpy'nut?" You may be wondering: Plumpy what? For those who work in global health, the word is instantly recognizable. Just over a decade ago, a French doctor invented a treatment for severely malnourished children that had a revolutionary, life-saving impact. The product goes by different names in different parts of the world, such as Plumpy'Nut, Nourimanba and Chiponde. It's basically peanut butter with some added ingredients: dried milk, oil, sugar, and essential minerals and vitamins. Among specialists, the life-saving peanut butter paste is called a ready-to-use therapeutic food — an RUTF. 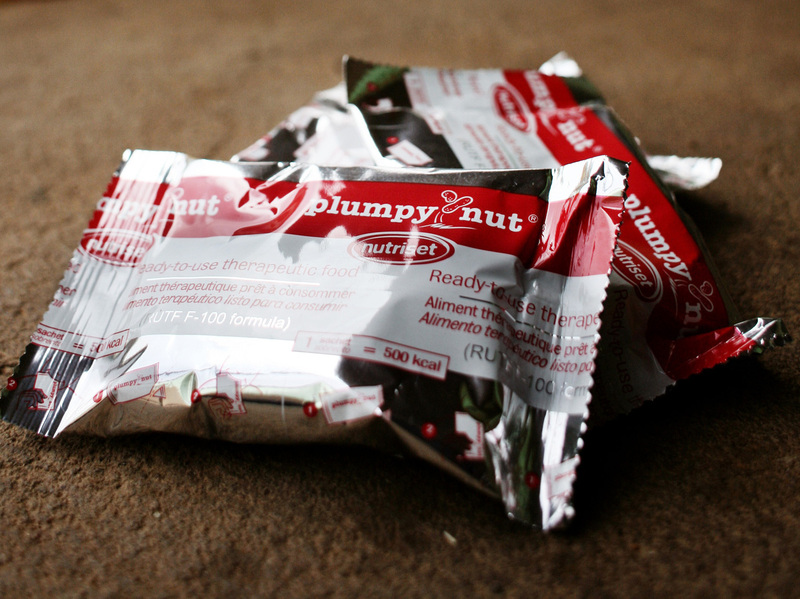 Here's a nutritional profile of a single packet of Plumpy'Nut, the best-known of the products. But Plumpy'Nut is not the answer to the question: What's for dinner? "You have to think about it like a drug rather than food," says Meera Shekar, the World Bank's health and nutrition specialist for Africa. It's not a substitute for foods like milk, eggs, meat and grains. "This is for kids who are severely malnourished to help them get back to a normal weight," she explains. Studies have shown that this formulation is one of the most effective ways to nurse malnourished kids back to health, which is why organizations like UNICEF as well as smaller NGOs use enriched peanut butter. The supplements are individually packaged and ready to eat. Public health officials in regions with high rates of malnutrition have also tried distributing Plumpy'Nut and similar products as a preventive measure — as a snack to keep kids well-nourished — with varying degrees of success. These bars don't come cheap. It's hard to pin down exact costs, but Shekar estimates that feeding one child enough packets of Plumpy'Nut to treat malnutrition can cost anywhere from $50 to $200, depending how far the bars have to travel and where they are manufactured. The bars are mostly produced in the U.S., Europe and increasingly in India, Africa and South America. "So in some countries, people have reservations because it's seen as a foreign product," she says. In some countries — including Bangladesh and India — researchers are developing therapeutic foods with locally sourced ingredients. They're even trying alternatives to peanuts, like chickpeas and lentils, says Werner Schultink, UNICEF's chief of nutrition. "We are basically trying to come up with more recipes," he says. These alternatives are still being tested to make sure they're as effective as the classic Plumpy'Nut. "Still, we have to be very careful with the safety of these products," Schultink says. An organization called Meds & Food For Kids has managed to make enriched peanut butter using Haitian peanuts, but each batch must be tested because peanuts grown in Haiti and throughout the developing world are easily contaminated by aflatoxin, a fungus that can make children ill. In some areas, crops are also prone to contamination from E. coli and other bacteria. "This is something we're also keeping a close eye on," he says. Ultimately, Schultink says, "there are 18 million children around the world suffering from malnutrition." This may be due to extreme poverty or a lack of resources in a region. In some areas parents and caregivers may now know what or how much to feed children, or they may choose to feed boys more than they do girls. Often, children become malnourished after a bout of a disease like malaria. Yet only about 3 million out of 18 million of these kids are getting treatment. "In one way or another, all these kids deserve extra care and attention, and we have to figure out how to find them and get them treatment," Schultink says. "There is a long way to go, and this is a very complicated issue. For now, RUTFs are one of many things to have in our tool box." It is also one of the many random things in Hillary Clinton's inbox. We may never fully understand the significance of the email that Clinton so carefully crafted. But at least we can say we've solved the puzzle of "Plumpy'nut?"